"It's bad. It's decaying and getting worse. Given the depth and magnitude of the recession, you can argue that we are facing a storm of epic proportions and we're only at the beginning." Victor Calanog, Reis director of research. Reis is reporting the vacancy rose to 15.9% in Q2; the peak following the previous recession was 17%. 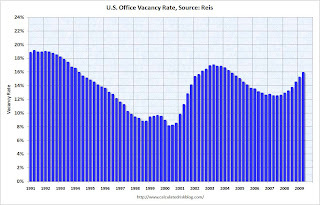 The U.S. office market vacancy rate reached 15.9 percent in the second quarter, its highest in four years and rent fell by the largest amount in more than seven as demand from companies and other office renters remained weak, real estate research firm Reis said Inc.
... Reis ... forecast [is] for the U.S. office vacancy rate to top out at 18.2 percent in 2010 and for rent to continue to fall through 2011.